Online video is serious business. For meetings. For the hospitality business. For any number of media verticals. For business in general. But you know the problems. It’s not always easy, making sure that everyone has the right players installed. Which is what makes Shodogg a player in the space (not to mention a winner!). Shodogg literally unleashes every screen. With their patented technology, they make it easy to access, control and share files and videos from anywhere in the world, to any size audience. And to any internet-connected screen. 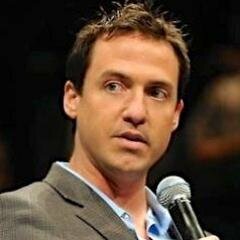 Cofounder and CEO Herb Mitschele tells us why it’s the next generation content mobility platform. 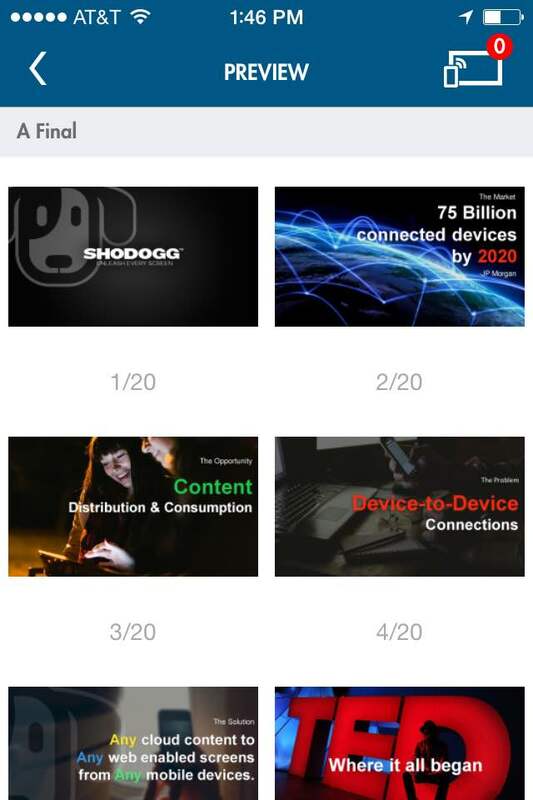 Shodogg is the next-generation content mobility platform, designed to give enterprise content management the same agility as the consumer market. Our patented Shodogg technology turns any connected mobile device (smartphone, tablet, etc.) into a Cloud Remote Control, able to access digital content stored on any cloud or secure server, and instantly cast that content to any other connected screen (smartphone, tablet, computer, smart TV, etc.). Unlike peer-to-peer streaming or screen sharing technologies, Shodogg’s patented architecture allows users to instantly access and cast content between devices without needing to download additional plugins or install hardware. The technology is completely agnostic to device type, operating system, browser type and network connection. While other technologies are limited to certain brand or WiFi compatibilities, Shodogg’s unique technology allows users to make connections from anywhere in the world, to anywhere in the world. Shodogg technology accesses and distributes media from its original source, so HD quality files maintain their clarity, and videos play seamlessly without buffering. Enterprise businesses are our main market focus. These large companies have the greatest need for integrating new content management technology to bring them up to speed with consumer technology adoption rates. In order to be successful in today’s market, enterprise businesses need to be more agile, mobile and plan for future BYO trends among the workforce who are already driving the consumer markets. Our technology is currently powering solutions for enterprise businesses in the technology, hospitality, media and healthcare spaces. The size of our target market today is estimated at over $5.5 billion dollars, with an average annual growth of 16 percent over the next four years, as predicted in the Enterprise Content Management Market study conducted by The Radicati Group. The pain that we are solving reaches across all enterprise verticals – we’re streamlining the management of content and giving businesses a new technology for distributing content to their stakeholders without requiring changes to the current infrastructure of the business. 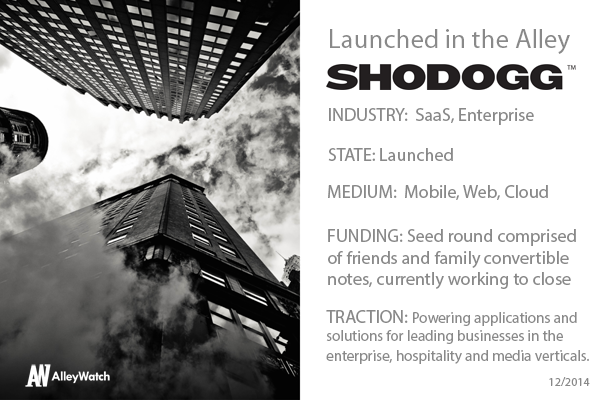 The technology is available as a SaaS model providing a mobile application called Shodogg Connect. The application can be licensed per month or annually per user and as well as by teams. Additionally, the technology can be integrated into existing or new applications, creating a holistic approach to accessing, distributing and analyzing content. Shodogg Connect is available for download on the iOS app store. Your company recently won the Techweek NYC Launch competition. Tell us about that experience. The LAUNCH competition is intense – a full day of non-stop demos in a tech fair environment, then if you’re voted one of the Top 5 startups by the judges (out of over 40 startups), you give a fast-paced onstage demo to some big name VC, advisor and founder judges, whom you definitely want to impress! Winning this year’s Techweek NYC LAUNCH competition was a major accomplishment for our company after years of hard work finding the right target market and strategy for our complex technology. This win proved that people can easily see the value in our technology and are eager to see us innovate the industry of cloud content management. The Techweek NYC event itself is an awesome experience for startups – it’s a great collaboration of panel events featuring startup advisors, VCs and founders, mixed with startups from every industry. We’ve had a working relationship with Hewlett Packard over the past two years, and we will have a major announcement concerning our technology with the company in the next few months. We are also in a great place with our funding, looking to close our Series A shortly and anticipate rolling into our Series B round quickly. We’d love to get in front of Fred Wilson. He has consistently found breakout companies and has great vision for paradigm shifting opportunities and business models. When we were launching the company, the majority of our cofounders were already located in New York, and knew the many benefits of launching a technology startup here. There is a huge pool of talent growing here, an amazing angel and VC community, and tons of startup support, all in a market that moves quickly and is making a name for itself outside of the Valley.